There are potential relationships living among the documents in your Elastic Stack; linkages between people, places, preferences, products, you name it. 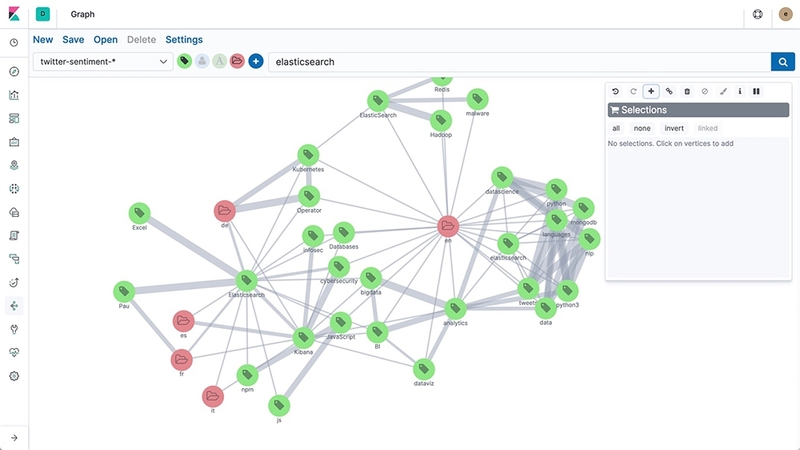 Graph offers a relationship-oriented approach that lets you explore the connections in your data using the relevance capabilities of Elasticsearch. NewThe code for graph features is now open and available in our public GitHub repo. Graph is an API- and UI-driven tool that helps you surface relevant relationships in your data while leveraging Elasticsearch features like distributed query execution, real-time data availability, and indexing at any scale. Fraud: Discover which vendor is responsible for a group of compromised credit cards by exploring the shops where purchases were made. Recommendations: Suggest the next best song for a listener who digs Mozart based on their preferences and keep them engaged and happy. Security: Identify potential bad actors and other unexpected associates by looking at external IPs that machines on your network are talking to. Common in most datasets are "super connectors" — things like Amazon for purchase history data, the Beatles for music, and Shawshank Redemption for movies. They're like actor Kevin Bacon; you're never separated by more than a few hops. It's the ability to identify the difference between popularity and relevance that is key. We've taken our deep knowledge of information retrieval and combined it with the rich statistics that Elasticsearch generates while indexing to calculate the relevance of the relationships — bringing back the most meaningful links first. It's easy to get started with exploring the connections living in your existing Elasticsearch indices. There are no new data formats to fiddle with. No new indices to create. No third-party systems to maintain. No higher taxes. Just go and be curious. The Graph API leverages Elasticsearch's aggregations and query language, providing a simple API for graph exploration. There is no need to define complex ontologies and learn a new query language. It's flexible, it's natural, and lets you guide your exploration using powerful search features like geospatial filters. A single link in a graph may represent thousands of documents, like banking transactions between two accounts. The Graph UI in Kibana lets you visualize these connections. Drill down into the details using any of the maps, timelines, pie charts, or raw document visualizations in Kibana. Click through and interact with your graph of networked entities, view the strength of connections, and even customize colors and icons. Relationships don't have to be complicated. Find out why.